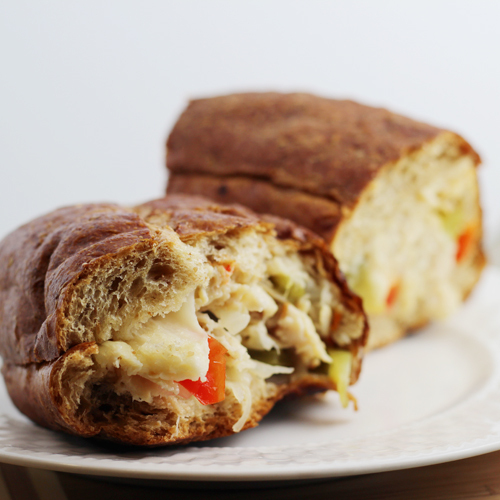 In our house, sandwiches are a popular dinner and these Oven Baked Chicken Cheesesteak Sandwiches are one of the top favorites. 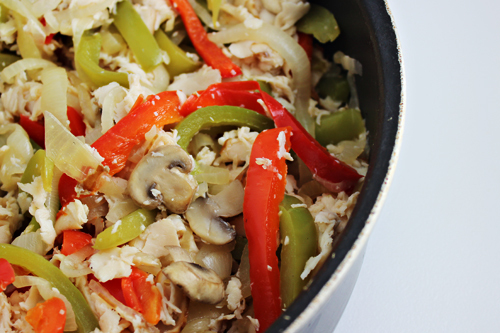 Easy-to-make with sliced chicken and cheese, plus the addition of bell peppers, onions, and mushrooms. I believe I’ve talked before about my love of sandwiches. Cold or hot…I love them all. And I don’t think I could ever get tired of sandwiches either. Sandwiches and me get along beautifully. Luckily, the same is true of sandwiches and everyone in my family. My kids seriously get excited for hand-held dinners. When it comes to hot sandwiches, there’s a few that we make frequently in our house: Oven Baked Meatball Sandwiches, Grilled Cheese, and Philly Cheesesteaks. 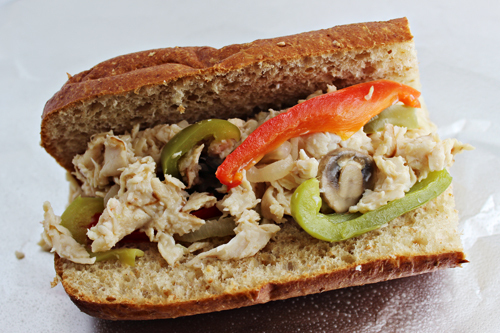 The recipe I’m sharing today is a chicken version of our Philly Cheesesteaks called….what else? Oven Baked Chicken Cheesesteaks. It’s an easy dinner idea that’s perfect for hectic weeknights or munching on while watching the game during the weekend. To start, I used Castle Wood Oven Roasted Chicken Breast Sliced Lunch Meat, available at Sam’s Club, that I bought on a recent shopping trip. I opened this package and turned it out onto a cutting board where I gave the entire pile of lunch meat about 3 cuts with a knife — I didn’t want to chop it, but I wanted to make the pieces a bit smaller. I used this entire package for 6 sandwiches. 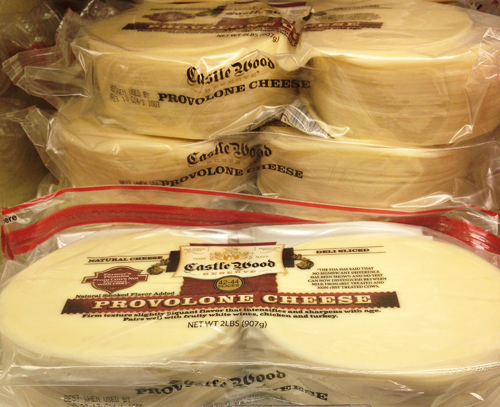 For the cheese, I used Castle Wood Provolone Sliced Cheese, also available at Sam’s Club. I used half (1 pound) of this package. I sliced bell peppers and onion. I also used 8 ounces of sliced mushrooms. 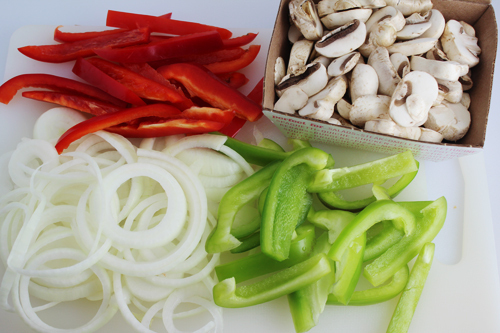 In a large skillet, the bell peppers and onions were sauteed in a bit of olive oil until tender-crisp. Then the mushrooms were adding and cooked until slightly softened. 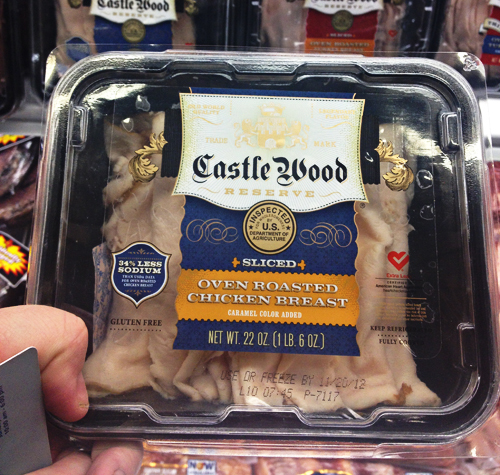 The heat was turned off and the Castle Wood Chicken Lunch Meat was gently folded into the vegetable mixture. Once that was combined, the cheese was cut into quarters and folded into the mixture. If necessary, turn the heat on low to help the cheese melt. I use hoagie rolls that are either whole and I cut them so one side is still attached. Sometime I buy pre-cut hoagie rolls, but I make sure to buy ones that have one side attached. I made our Oven Baked Chicken Cheesesteak Sandwiches so that they were individually wrapped in foil. 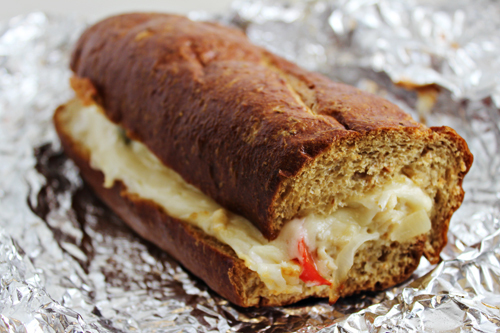 To do this, I teared a piece of foil that will be large enough to wrap around the sandwich and spray it with a bit of cooking spray (this helps to make sure the cheese won’t stick to it). 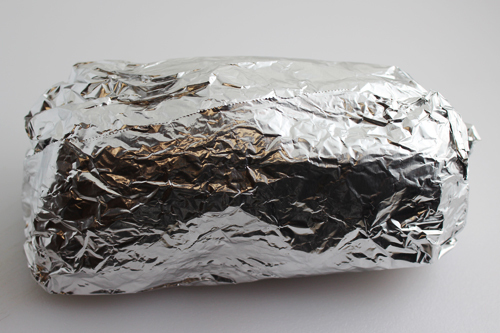 I lay the foil on the counter, sprayed side upwards, and place my roll on the foil. Then, the Chicken Cheesesteak mixture is added to the roll. 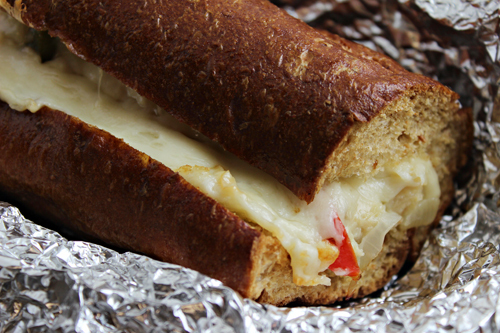 Two slices of Castle Wood Provolone Cheese are torn in half and placed on top of the Chicken Cheesesteak mixture. Then the entire sandwich is rolled up in foil. 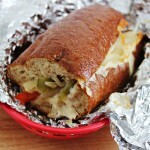 The foil wrapped sandwiches are set on a baking sheet and baked in the oven until hot, toasty, and melty. When they are done, you can unwrap and enjoy! Open lunch meat and turn entire package out onto a cutting board. Cut the pile of lunch meat in thirds cuts with a knife so the pieces will be smaller, but not chopped. Set aside. 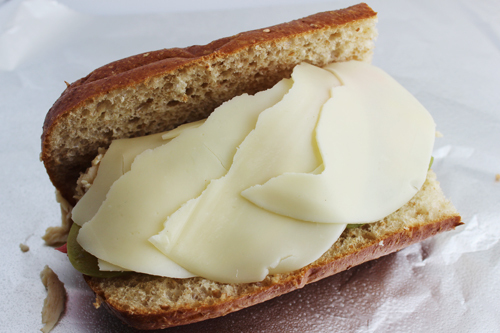 Remove 6-12 slices of provolone cheese from the pound (depends on if you want one or two slices on top of your sandwich for melting). Cut the remaining Provolone cheese slices in quarters. Set aside. In a large skillet, heat olive oil over medium-high heat and add bell peppers and onions. Saute until just tender-crisp. Add mushrooms to mixture, saute until slightly softened. Turn heat off. If there is any liquid in the bottom of skillet, drain this off. Add chicken lunch meat into vegetable mixture by gently folded into the mixture. Once the lunch meat is combined with the vegetables, add the cheese that was cut in quarters and fold into the mixture. If necessary, turn the heat on low to help the cheese melt. Remove from heat once cheese is just barely melted with mixture. Once again, if any liquid is in bottom of skillet, drain off. Tear a piece of foil that will be large enough to wrap around a sandwich and spray it with a bit of cooking spray (this helps to make sure the cheese won’t stick to it). Lay the foil on your work space, sprayed side upwards, and place the roll on the foil. Add 1/6th of the Chicken Cheesesteak mixture to the roll. Top with 1-2 slices of Provolone cheese, tear to fit, if necessary. 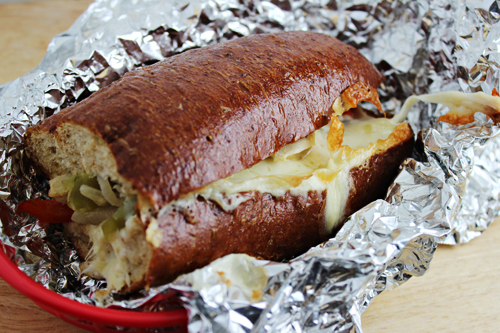 Wrap the entire sandwich in the foil, taking care to keep keep cheese side upwards. Repeat with remaining sandwich rolls. Place foil wrapped sandwiches, cheese side up, on a baking sheet and bake in a 400 degree oven for about 10-15 minutes, or until cheese is melted, mixture is hot, and bread is slightly toasted. Remove from oven, allow to cool slightly, unwrap carefully, and enjoy! –If you prefer, you don’t have to wrap individually in foil. 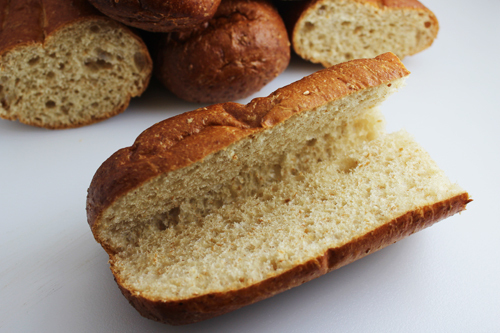 Simply place the filled hoagie rolls on your baking sheet, side by side, and bake until hot and bubbly. –If you like avocado, before adding the cheese slices to the top of your sandwich, add a few slices of avocado, and then top with the cheese and bake as usual. For more information on #MealsTogether with Sam’s Club, like them on Facebook and follow them on Twitter. 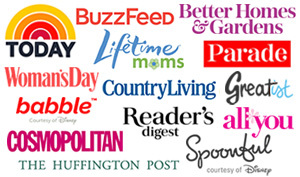 Note: I am a member of the Collective Bias® Social Fabric® Community. This shop has been compensated as part of a social shopper insights study for Collective Bias™ and Sam’s Club Private Label #CBias #SocialFabric This recipe, all photos, and opinions are 100% my own. Would you mind if I link back to this recipe on my blog? I’m doing a post about the Oscars and some recipes to theme with each best picture nominee. I wanted to use your oven baked chicken sandwiches for Silver Linings Playbook. =) Thanks for letting me know! Of course…link away!! All I ask is that you don’t reprint my recipe or the content of the post. You are welcome to use one of the photos too, if you would like, all I ask is that credit is given and there is a clear link back to me. Thank you for asking and I look forward to seeing your post!